of the thickness of the piece from the entrance surface. 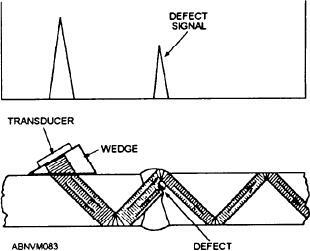 beam method, shown in figure 11-12.
where possible, evaluate the nature of the defect. indication on the CRT screen. major requirements for weld inspection. the greatest possible direct reflection of sound. shown by the dotted line in figure 11-13.